Specialized hoses and components to meet drinking water requirements. Available as an option. LED lighting packages and the only water trailer manufacturer to offer galvanized decks and frames. Your Application. Your Water Trailer. Configure with dually axle, hose reels, side sprayers , rear sprayers and more. Select from translucent, black or green to reduce algae, steel or stainless steel. Professional Grade Water Trailers and Water Buffalos for Government and Industry. Wastecorp is an ISO 9001 certified manufacturer of pump systems including water trailers. Water trailers are designed for on-site water delivery, dust control on construction sites, heavy equipment washing, race track use and parking lots. With a choice of high pressure or trash pump models manufactured by Wastecorp, you'll get the water delivery solution you need by a proven manufacturer. Wastecorp water trailers are designed and manufactured in the United States and Canada. All water wagons and water buffalos include tanks made from resins that meet FDA specifications. NSF compliant tanks and components for drinking water also available. 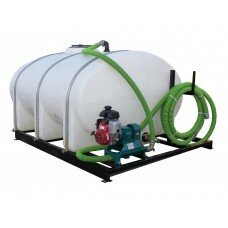 Tanks are also available in green, black or translucent that may reduce algae growth. 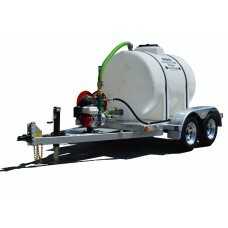 Your complete water trailer package includes all hoses plus available optional equipment like "site tough" side sprayers that can connect to fire hoses or hydrants and self loading quick connect tools. Wastecorp water trailers are manufactured for commercial, municipal, industrial and military applications. Your choice of 50-200 gallon tanks . Mounted on an ATV towable frame with turf tires50-200 gallon fr..
325 gallon trailer mounted water trailer. Single axle galvanized trailer with rear sprayers and opti..
525 gallon trailer mounted water trailer. 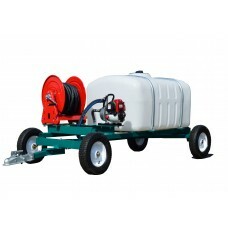 Double axle, galvanized trailer with rear sprayers and opt..
Skid mounted water trailers do not have wheels or an axle. 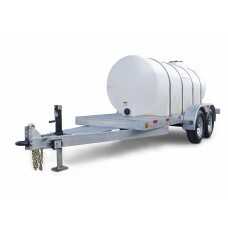 However, you can move a skid mounted water trailer with an optional lifting bail. 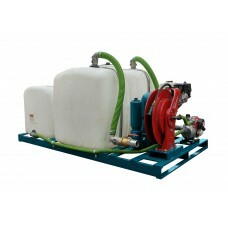 Skid mounted water trailers are used to mount in trucks, on an ATV trailer, on a concrete pad or on land. 525 gallon/1893 litre tankTrash Flow® Model: TFX-2M, 2” x 2” centrifugalpump powered by a 4HP Honda ..
1025 gallon water tank, all hoses and and fitting. Mount in your truck or on land. Trash Flow® ..
1600 gallon water tank, all hoses and and fitting. Mount in your truck or on land. 1635 gallon/6057 ..
Water buffalo, clean water transportation system (no pump) in 500-1600 gallon sizes NSF drinkin.. 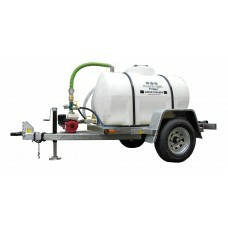 Looking for a FDA compliant Water Trailer? Wastecorp's Water Trailers can be made to meet your FDA compliant requirements. Choose from FDA compliant polyethylene or stainless steel tanks. All pump parts, hoses and valves can also be ordered as food grade.